12", 2008, This delightful roly-poly character is fully jointed and constructed of the finest custom made mohair plush and cotton. She features realistic coloring, a molded nose, glass eyes, inset whiskers, and separate fingers with resin claws. Mrs. Tiggy-Winkle comes outfitted in a layered felt and cotton costume which will include custom printed fabrics in the soft, delicate shades of the watercolor illustrations. Her spiky tipped mohair pokes through the fabric of her organdy bonnet and on her feet she wears hand cobbled felt and leather boots. 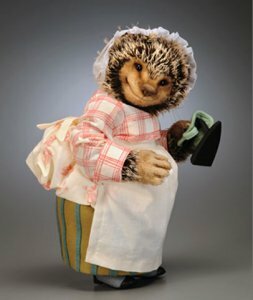 In one hand, Mrs. Tiggy-Winkle holds a quilted felt potholder and her own custom made miniature sadiron! No detail has been overlooked in striving for the utmost in accuracy to the original Beatrix Potter images. Produced in a numbered limited edition of just 500 pieces worldwide, Mrs. Tiggy-Winkle will come inside a deluxe RJW presentation box. Included will be the signed and numbered Certificate of Authenticity and forms for owner registration.